Winter hiking is a wonderful activity. The air is crisp, and everything around you feels fresh – especially if you find yourself going for an early morning expedition. It’s a time of relaxation and contemplation, which is great if you are seeking to escape the ordinary world. 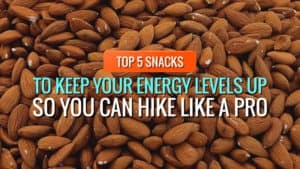 However, every winter hiker needs to find the best gloves for hiking to keep their hands warm and protected from the element. 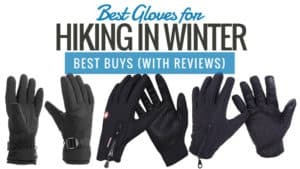 Check out these hiking glove reviews and see if you can find your perfect match for the winter hiking season. It can be tricky choosing a pair of winter hiking gloves, as there are so many available for you to look at and contemplate. 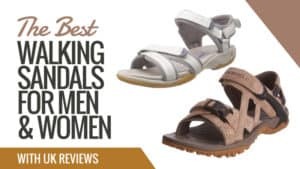 Here are a few tips for choosing your ideal pair. 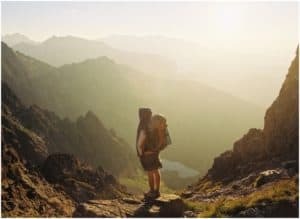 The first thing you need to ask yourself is ‘where are you going?’ If you are hiking in Britain over the winter months, then the majority of hiking gloves on the market will be fine for you to use and stay warm. 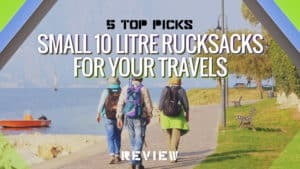 However, if you are going for a Nordic hike or to generally colder climates, you will want to find something that is far more thermal. Make sure you read through product descriptions carefully to make sure they are going to be warm enough for you. 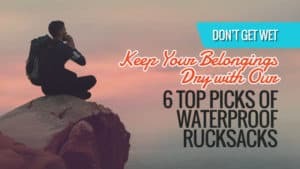 You should always pick a pair of gloves that are at least water resistant so that you don’t end up with cold and soggy fingers if you get caught in the rain while you hike. 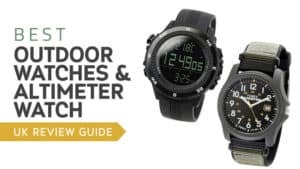 If you are going to colder climates where it snows, make sure you pick a pair that is snow resistant and has secure wrists so that the snow can’t get in. 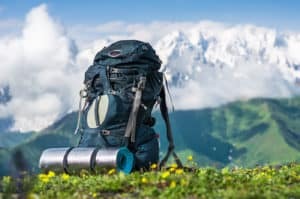 A padded palm is also incredibly useful when it comes to winter hiking gloves, as this helps you to hold on to your trekking poles, or other important equipment, during all kinds of winter weather. Picking gloves with added grip is an absolute must in the winter. The best gloves for hiking have a padded palm with increased grip. 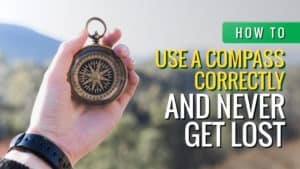 Always make sure you read the reviews before you commit to a purchase and don’t associate the price tag with the quality of the item until you have done so. 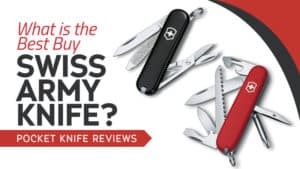 The reviews can tell you a lot about an item and people’s satisfaction with it. 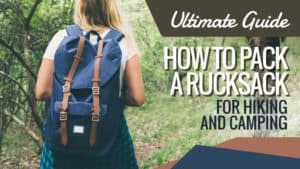 They can be a great guide to deciding which product is best for you. 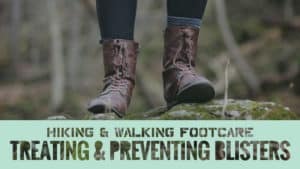 There are a few things worth looking for before you go and buy a pair of winter hiking gloves. One of these is the material that the inner lining is made from. Wool tends to be more breathable than synthetic materials like polyester, and so when you go to buy a pair of gloves, it is worth checking. After all, sweaty hands during your winter hike can be quite unpleasant. 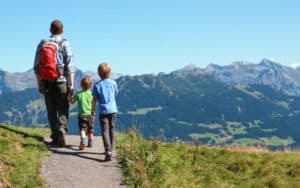 If you feel as though you will need to use a touchscreen mobile device while you are out on your excursion, a pair of gloves that were designed to let you use your touchscreen is the right call for you. This way, you don’t have to remove your gloves at any point, and you can still use your phone with ease. It lets your hands stay warm without getting in the way of your tech. Look for gloves with a secure wrist. 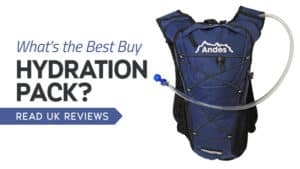 As mentioned in the previous section, this is great for hiking in cold climates that have a lot of snow. 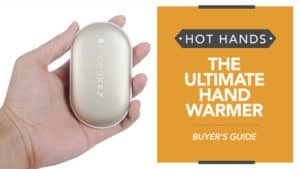 However, the secure wrist can also keep the wind out and help to trap heat inside – leaving your hands warmer than ever before. An elasticised or Velcro adjustment are excellent ways of keeping your glove (and warmth) secure. 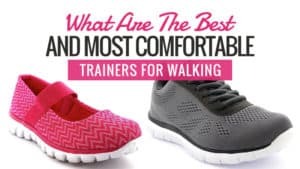 All that’s left is to choose the perfect pair for you. 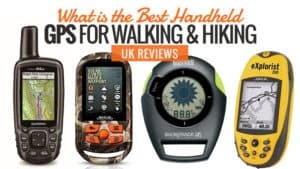 Take a look at our hiking glove reviews for some of our favourite models. If you are looking for a glove that has a little femininity but still does an excellent job of keeping your hand warm, then this may be the one for you. 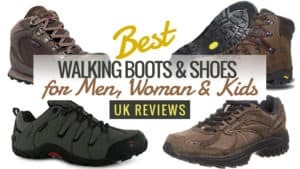 Take a look at the review below and see if they are the right winter hiking gloves for you. These gloves have a waterproof coating which leaves rain and other moisture dripping off instead of soaking through. So your hands will stay dry even during wet conditions. 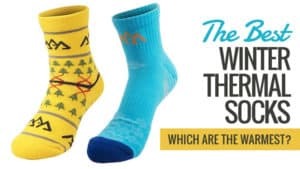 They have a breathable cotton lining to prevent sweating and are also windproof. The wrist buckle allows you to have your gloves as tight or as loose as you want so that you benefit from maximum levels of comfort. Plus, it helps to keep snow out of your glove. The textured palm means that it is anti-slip, so you have a better grip on things like trekking poles during any kind of weather. The material does feel quite thin compared to other thermal gloves, and so may not be ideal for places with very harsh winters. 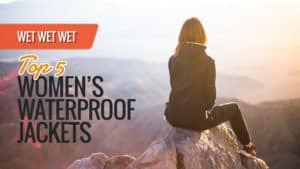 These affordable gloves for ladies could be some of the best lightweight gloves for hiking on the market and are sure to keep your hands warm when you go backpacking or trekking. 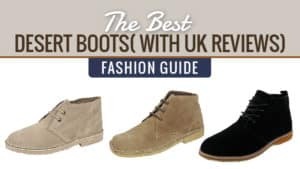 While they may not be ideal for places with harsh winters, they are perfect for the UK winter weather and will be sure to keep you feeling toasty. 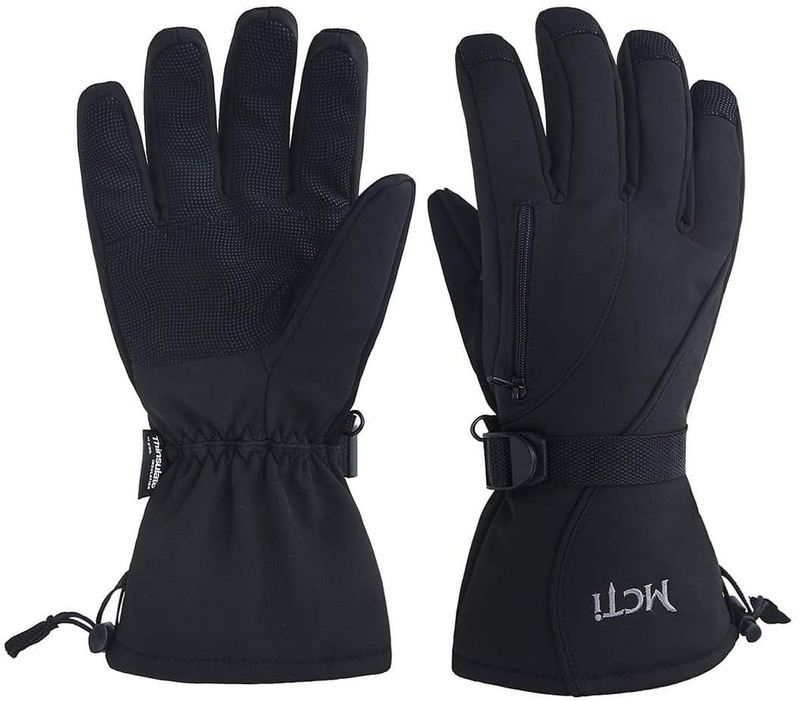 Q: How waterproof are these Kineed skiing gloves? A: Yes these gloves are 100% waterproof. They have a waterproof TPU membrane which wicks out moisture and keep hands dry in long time winter outdoors sports. It’s always nice to have a pair of gloves that are stylish as well as fully functional. 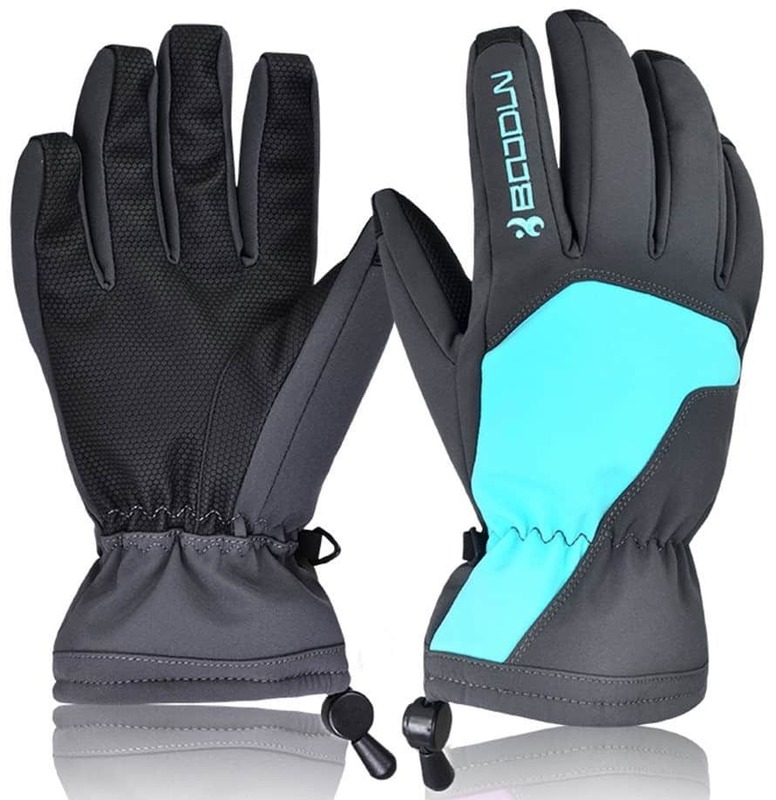 These gloves feature a sleek black and teal design, with an aim to keep your warm as well as looking good. 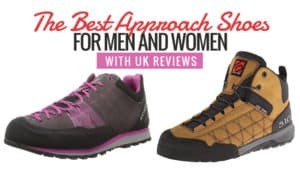 Check out the reviews below to see if these could be the right gloves for your next hiking trip. 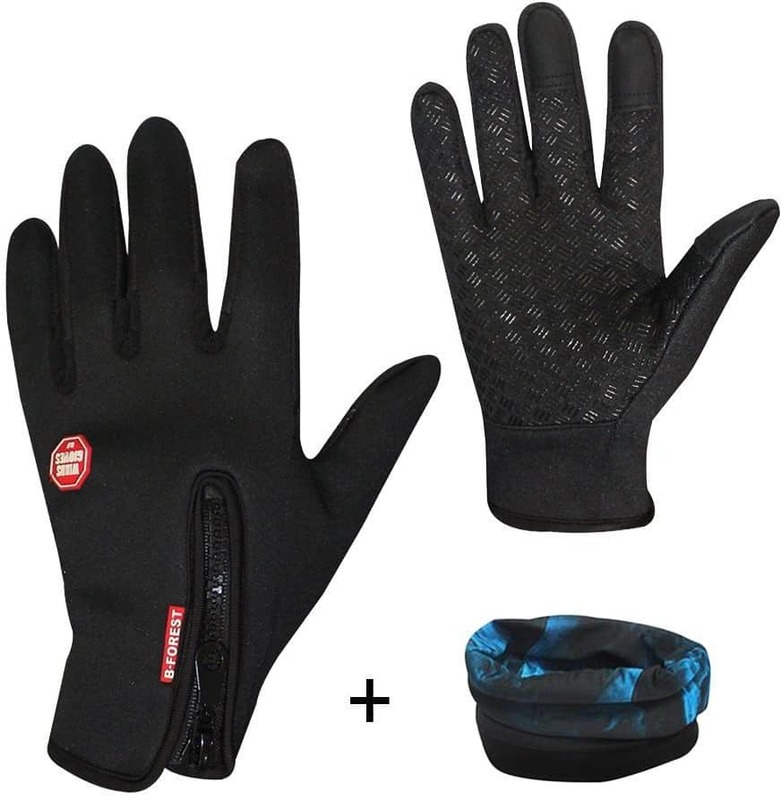 These gloves feature breathable waterproof material inserts, to prevent your hands from sweating but also to keep out snow and other forms of moisture. 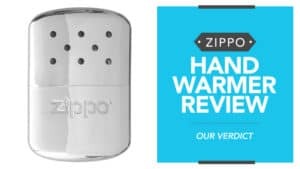 It has a polyester fleece lining so that your hands remain as insulated as possible. The rolled finger construction promotes comfort and flexibility, as they were made to fit your hands as perfectly as possible. The palms are durable and non-slip, allowing you to keep your grip on things like your hiking and trekking poles. It also has an elasticised wrist for a secure seal both against moisture and the loss of heat to your hand. They are often a little on the big side even after measuring your hands and the colours are not as bright as they appear in the photographs. Reasonably priced and made to keep your hands warm and protected from the elements, these are a great pair of gloves to go for. With a great design alongside practical features, these durable winter gloves are sure to keep your hands incredibly warm and dry throughout the winter months – no matter where you are hiking. 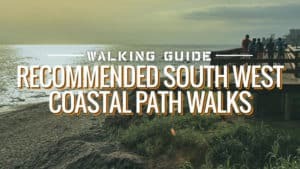 The North Face are one of the top brands for hiking and outdoor clothing. 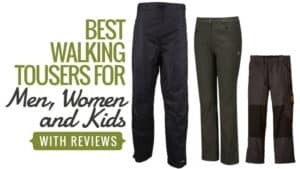 They have been providing warm and thermal outdoors wear for decades, and have some of the best quality pieces available. For a pair of hiking gloves, there may be no better place to go. These gloves are comfortable and versatile, especially as they have also been adapted to work with touchscreens. This way, you never need to worry about taking your gloves off in the cold again. Made for men, these soft gloves are incredibly thermal and will keep your hands warm during any winter hike you have planned. 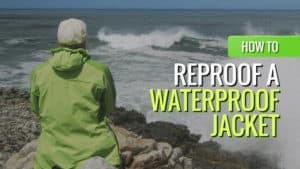 This is thanks to the polymer lining that acts to keep the gloves insulated at all times, and the fabric on the outside is water repellent so that even rain won’t leave you with numb fingers. There is a silicone coating on the palm for extra grip, which is handy if you are using trekking poles or other equipment. 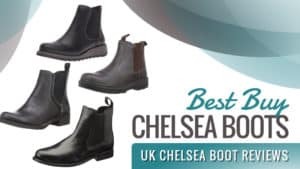 These have been noted as unsuitable for countries with particularly harsh winters. 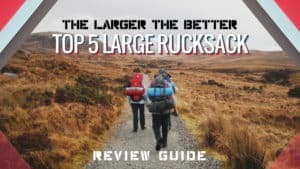 Some of the best gloves for hiking on the market, these are versatile and have a lot to offer the person wearing them. Plus, they are water repellent and offer an excellent level of grip during all weather conditions. They may not be great for countries with harsh winters, but for the UK they are absolutely perfect. If you are looking for a hardwearing pair of men’s gloves for hiking and other winter activities, these could be a good match for you. 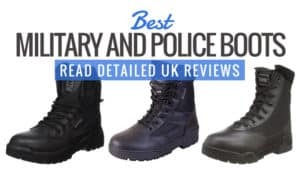 Why not take a look at the reviews for these nifty gloves and see if they are suited to you? 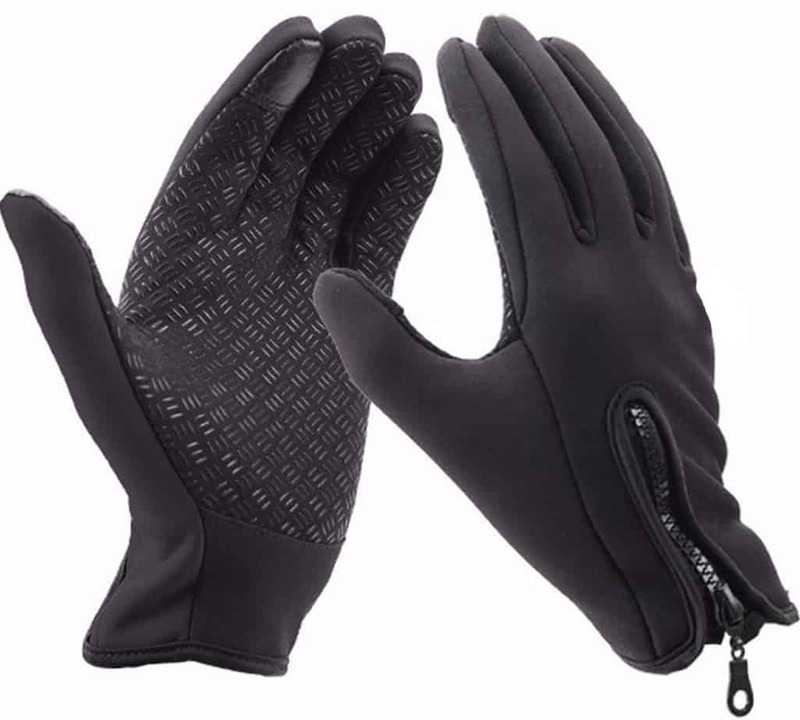 These gloves are hardwearing and practical, providing you with something that has an insulated fleece lining to keep you warm but also has a textured finish on the palms for better grip. 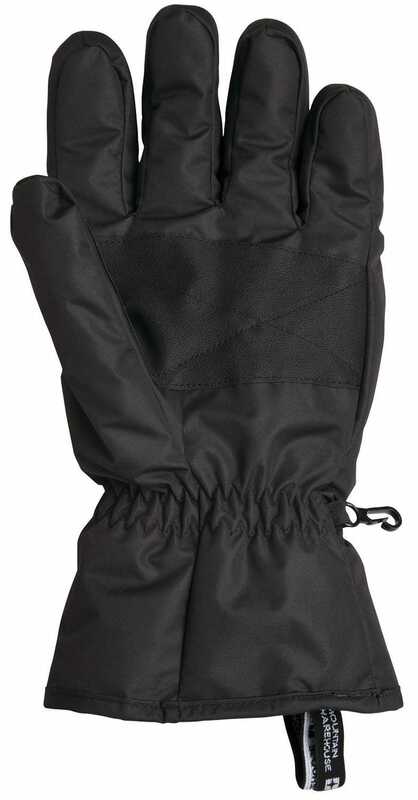 The lining inside is made from a snow proof fabric that is sure to keep any of the icy stuff out of your gloves. The elasticated cuffs are there for a fit that is not only more comfortable but also more secure. 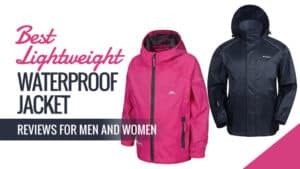 The fabric is, as mentioned before, resistant to snow, but it is also resistant to water in general – so no weather will leave your hands soaked through and freezing cold. These gloves are a little square when it comes to the general fit, and they are also not as insulated as they could be. 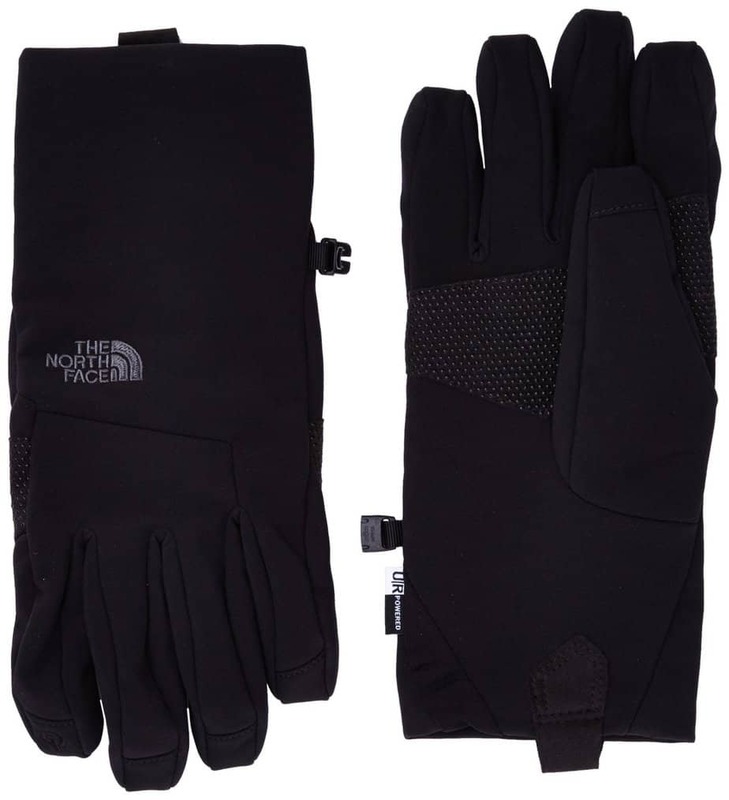 These gloves are highly affordable, and a good option if you plan on going walking or hiking in England over the winter. 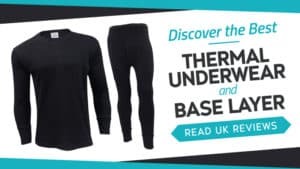 Comfortable and with a warm lining, they may not be insulated enough for use in very cold countries, but for the British winter, they make the ideal companion for your next trek. For ladies who like to embrace their femininity and sport fabulously designed clothing, these gloves might just be the thing for you. 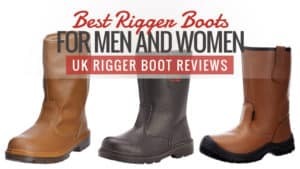 Stylish and practical, take a look at the reviews and see if they meet your needs. 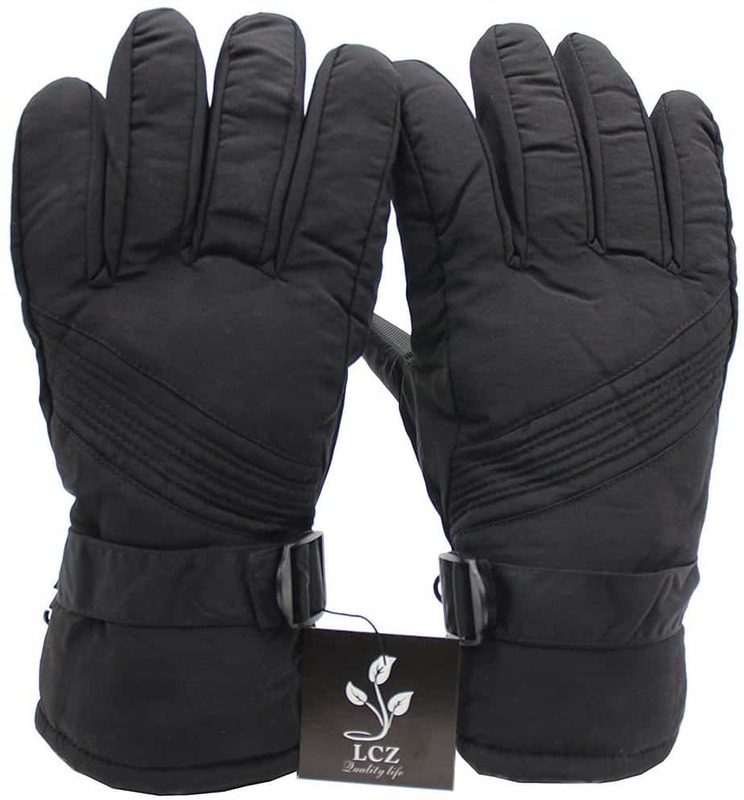 The outside of these gloves is made from a durable polyamide fibre and filled with a thermal cotton lining to keep your hands warm while you are out trekking and hiking. 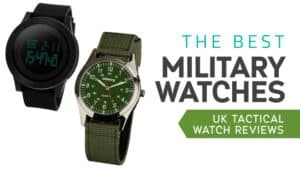 The cuffs are made to be windproof and stay comfortably around your wrist to prevent heat loss or any breeze from getting up and into your hand. 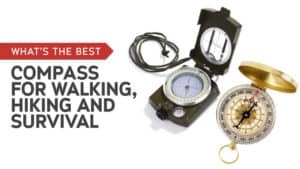 The palm is anti-slip and allows you to keep a good grip on things like hiking poles and other items. 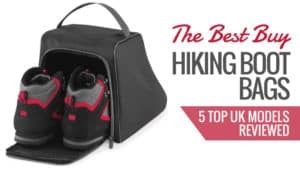 They are very breathable so that if your hands won’t end up sweating while you hike. 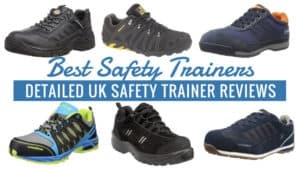 They are waterproof and incredibly well padded to keep you going through all kinds of weather. 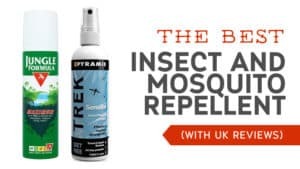 They do not seem to be as breathable as advertised, as some have noted that their hands still became quite sweaty. 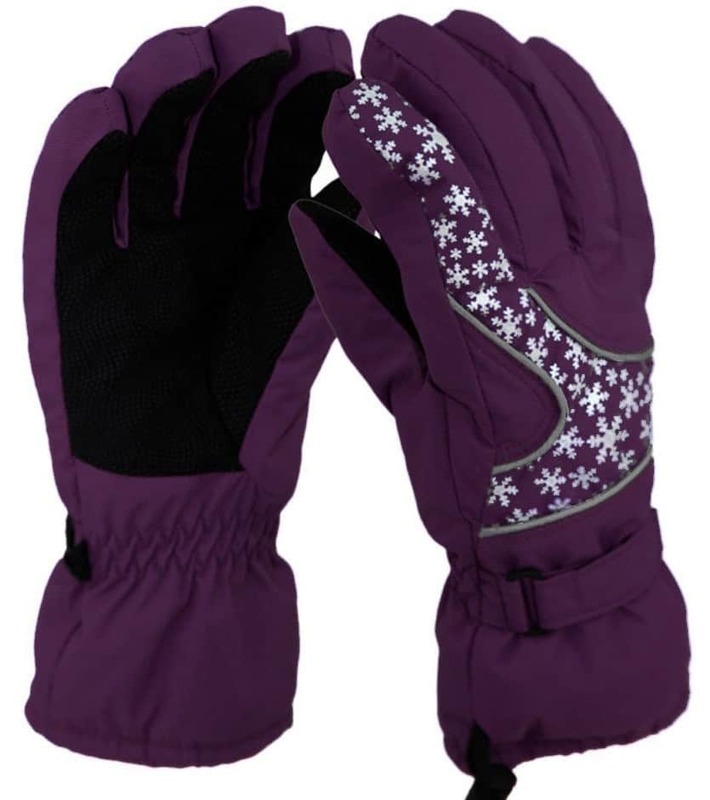 These gloves are stylish and very reasonably priced, making them a great companion to any lady who enjoys a winter hiking experience. Made to keep the weather out and the heat in, you are unlikely to find yourself with cold fingers in a pair of these. While some have found they aren’t breathable as stated, it’s often better to be a little too warm than freezing cold. Here are some other recommendations, in case the above selection did not have what you were looking for. 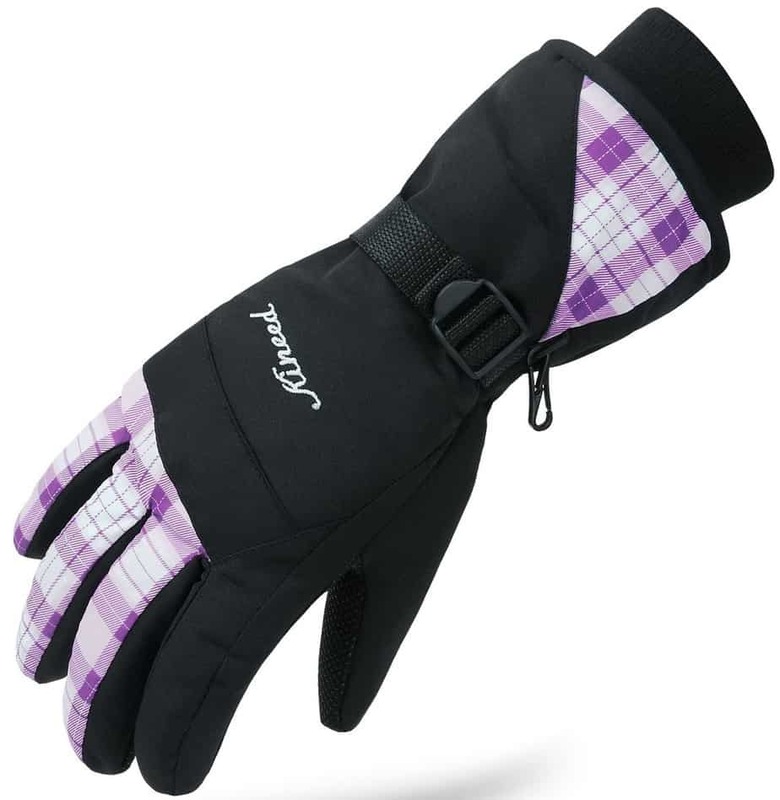 Made from flannel, these thick gloves are ideal for hiking during the winter months. 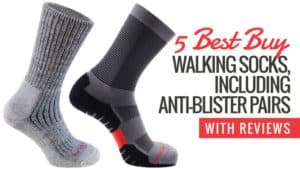 They are incredibly warm, so you won’t suffer from cold hands even in snowy or wet conditions. The palms have anti-slip PU leather on them, so you have a better grip on items such as your trekking poles. 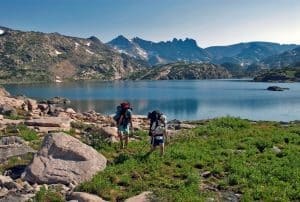 They can a little on the big side when it comes to the finger length, but generally speaking, these are some of the best waterproof gloves for hiking. These textile gloves have a warm and soft fleece lining on the inside, keeping your hands toasty during those particularly cold walks. The palm has anti-slip silica gel inside it, allowing you to keep your grip on your walking poles. 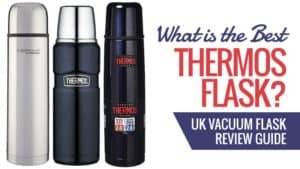 On top of this, they are also compatible with all of the latest touchscreen technology so you can use your phone or tablet without the need to remove your gloves. 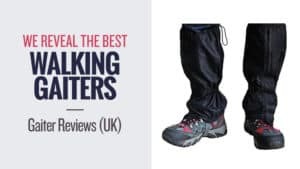 Cheap and cheerful, they are a good option for the winter hiker. 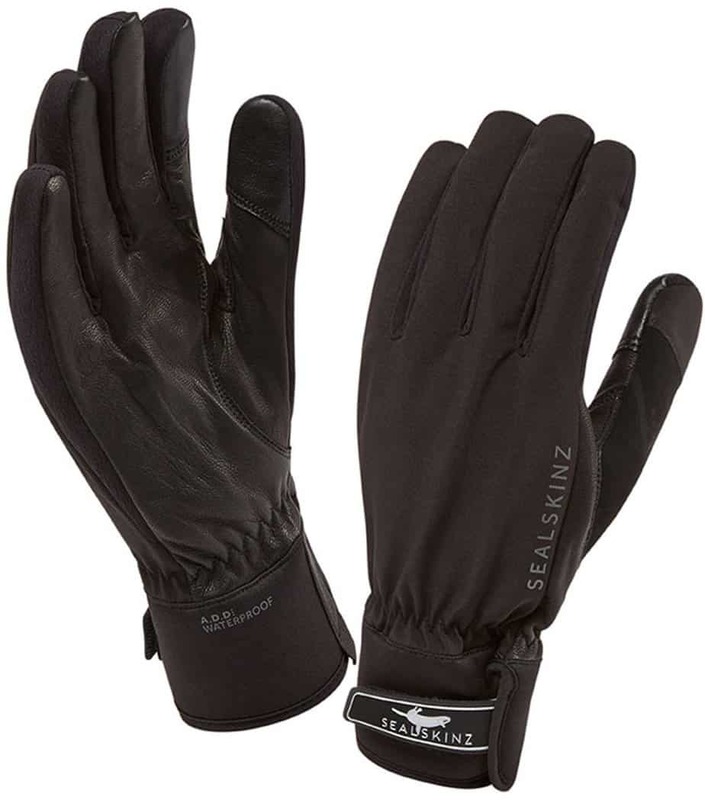 These sleek black gloves for men have a durable goatskin leather palm. The glove itself is both waterproof and windproof, so you can have toasty hands in any weather. They are made from a breathable material, and the thumb and forefinger have pads on them that allow them to be used with touchscreen devices. They are also anti-slip so you can keep your grip on important pieces of equipment during any weather. There have been a few issues with the waterproof element of the glove, but they are generally a good buy. These gloves also allow you to use touchscreen devices without needing to remove the glove. They have a zipper towards the wrist area that allows you to adjust the size of the glove so that it fits comfortably on your hand. 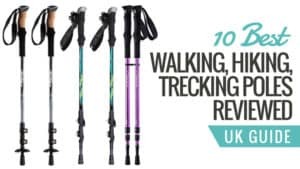 They are very thermal, and the palm has been designed to be anti-slip so you can hold tight to your walking poles. Windproof, and incredibly cheap, your hands are unlikely to go cold again. 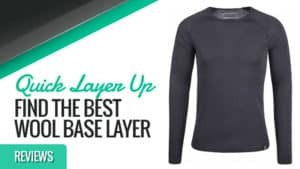 These gloves do have a very sleek and stylish look, and why they may look and feel as though they are made from a thin material, they are more thermal than many of the other gloves on the market. They have a PU and PVC palm that improves your grip during all kinds of bad weather. There is even a moisture wicking function if you find yourself starting to sweat while you are out and about. They may be a little pricier than most gloves, but they are worth every penny. 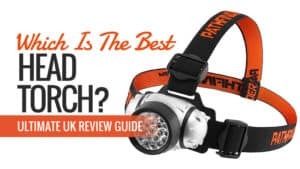 We’ve looked at some fantastic gloves in this guide, and there are sure to be a pair here that suit your needs for your winter hikes. 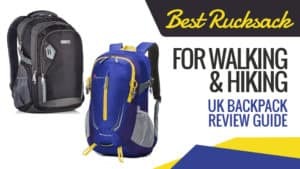 The North face offers one of the best quality and most reliable gloves for winter hikes in the UK, but if you are looking to go to colder, more Nordic climates, then you might want to try something else. If you are looking for thermal gloves for seriously cold weather, then take a look at the thermal winter ski gloves – the first pair in the “Other Winter Hiking Gloves” section. 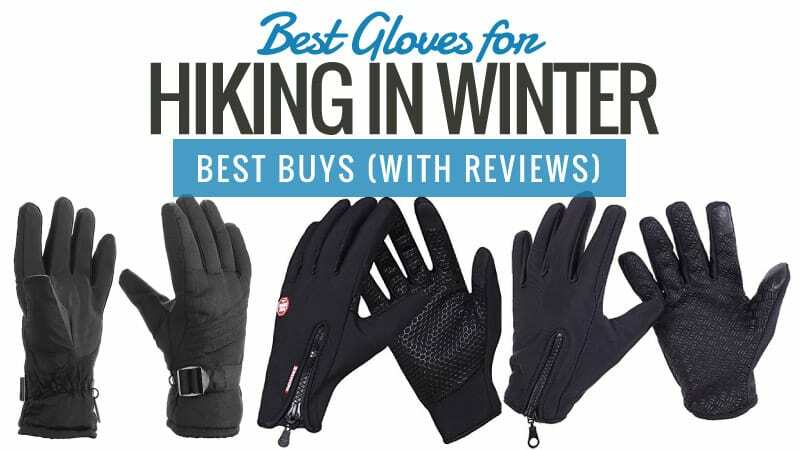 What did you think of our winter hiking glove selection? Are there any you would have added? We love hearing from you, so feel free to leave a message in the comments below.